The cells in the body have a continuous need to be ‘fed’ vitamins and mineral. Juicing high quality raw vegetables provides you with an abundance of nutrients for your body. Why not try this vegetable juice challenge for one week and let me know how you feel at the end of the seven days. Juice the following ingredients morning and night and slowly drink the juice. 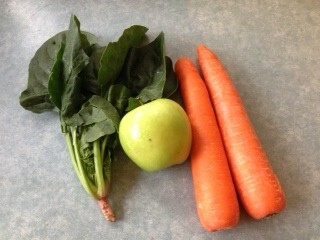 Wash all the ingredients prior to juicing. Cut the top off the carrot. Do not juice the core of the apple.